Are You Ready for the Upcoming PPI Claims Deadline? The PPI claims deadline is edging nearer. Now is the time to contact your bank and reclaim any money you are owed. As the best PPI claims company, Canary Claims want you to know all of the important facts about the upcoming PPI deadline. You can find out all about the PPI scandal and PPI claims here on our website. But, what’s important now is making sure that you make a PPI claim before the deadline. The Financial Times has predicted that hundreds of thousands of people could still be owed PPI from their banks. Over 18 million complaints have already been made and you could be the next one to reclaim your money. Why Has a PPI Claims Deadline Been Put in Place? The banks have paid out a huge sum of money so far for PPI refunds and plenty more will be paid out in the upcoming two years. Having a deadline in place for PPI claims means that the banks can budget and begin to ease their strain. The PPI scandal has also plagued the Financial Ombudsman. The FOS is dealing with a phenomenal amount of complaints from people appealing the decisions made by the banks. The PPI deadline will hopefully encourage people to make a claim if they haven’t already. If the PPI deadline is not promoted enough, thousands of people could be left unable to claim in a few years’ time. This is why we want to make everyone aware of the upcoming PPI deadline and explain how to make a claim. 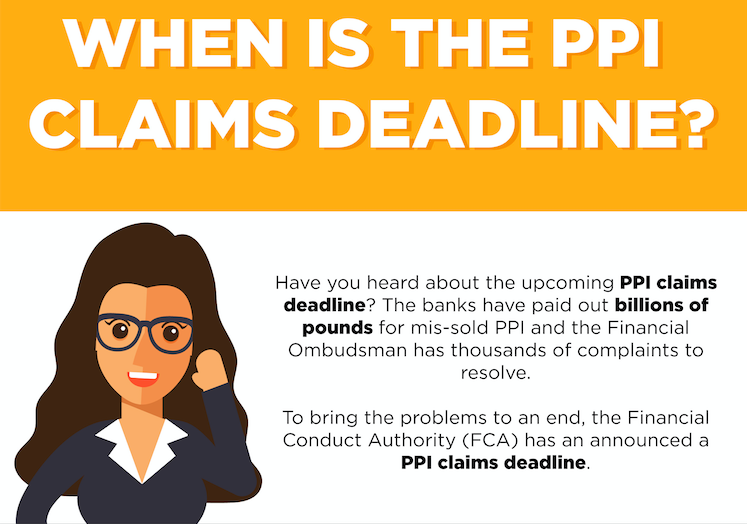 The Financial Conduct Authority (FCA) announced 29th August 2019 as the official deadline for PPI claims. You must get your claim sent to the bank before this date. Two years may seem like a long way away, but it will soon come around quickly, so starting your claim now is the best course of action. A PPI claim can take a number of months to be resolved by the bank and you will want your money as soon as possible. If you are yet to make a claim or you would like to make a claim on another product, it’s not too late. The first step is to find your paperwork from the product you took out with the bank and check if PPI was added. If it has, it’s likely that it was mis-sold to you. If you can’t find your paperwork, don’t worry. Canary Claims can find out this information. Once you have this information, you’re ready to make a PPI claim. Why is Canary Claims the Best PPI Claims Company? We know that there are a lot of PPI claims companies out there, but we also know that we are the best choice for you to make your claim. Why? For a start, you will never receive a cold call from us. We wait for you to come to us and explain your situation. Secondly, we are based in London. We do not outsource our services to another country. This means we are in the financial capital of the UK and know exactly what is happening with PPI claims across all of the banks and credit card providers. Finally, we offer one of the lowest service fees of 15% +VAT. We also provide a no win no fee policy [Cancellation charges may apply only if the claim is cancelled after the 14 days cooling off period. The fee would be based on the work done at the time of cancelling at a rate of £120 per hour and up to a maximum total of £180] so you don’t need to worry about paying us if your claim is not upheld by the bank. For a hassle-free PPI claim, we are the best PPI claims company. Don’t just take our word for it — read all of our testimonials from hundreds of happy customers. Why wait? With the PPI claims deadline looming, call our team today on 0800 634 8668 or start your claim online.